The “Qandus team” on stage at the Academy of Fine Arts in Warsaw. On screen Qandus Tifinagh dark. Image: Mariko Takagi. 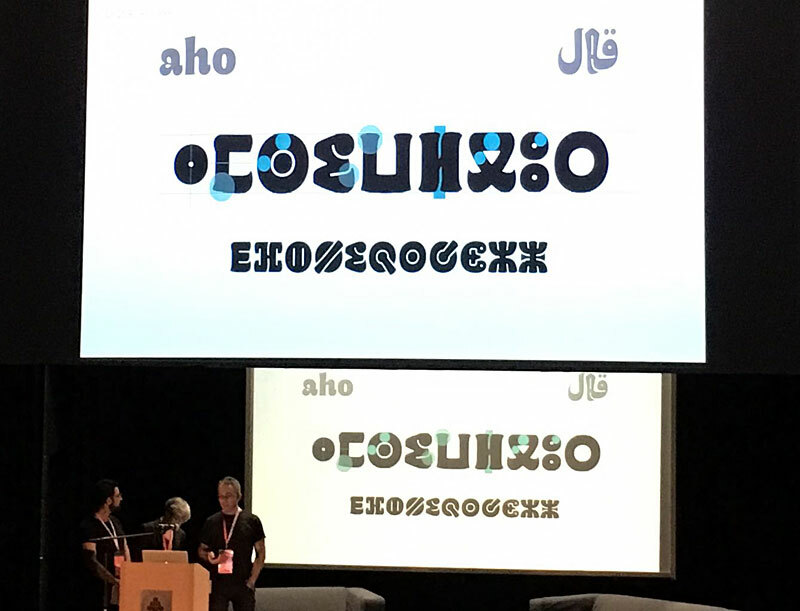 Few days after the presentation in Amsterdam Kristyan Sarkis, Laura Meseguer and myself came to the ATypI conference in Warsaw to talk about our experience designing Qandus, one of the type families developed during the Typographic Matchmaking in the Maghrib project. We called the talk “A Typographic Maghribi Trialogue” as a way to underline the intense and continuous exchange among the three cultures and writing traditions –Arabic, Latin and Tifinagh– that this project has called for, but also to recall the necessary respect for each one’s peculiarities and specific features. In my view, our’s was one of the projects that best matched the theme of the conference: convergence. Tradition and modernity converge in the beautiful skyline of Warsaw. It seems we created high expectations, which encourages us to keep on working and collaborating in order to extend the project beyond the three weights designed so far. The final family will comprise nine styles in three weights, each one showcasing specific features, ranging from solid to fluid constructions on the one hand, and from written to drawn procedures on the other. Those who attended ATypI 2016 in Warsaw had already a glimpse of the complexity involved. I hope we can show the results soon so, as Alice said, keep an eye out for it! A sample of Qandus Medium, the “wildest” of the three weights, showing the three scripts: Arabic, Latin and Tifinagh.